The summer months are generally regarded as the least rewarding in an orchid grower’s calendar, with fewer flowers than during winter and spring. This statement applies particularly to hybrids of the more commonly grown genera. Fortunately, there are many species orchids that flower during summer, and on occasion there are sometimes as many species as hybrids on our show benches between December and March. I grow the following species under shade-house conditions throughout the year, together with my cymbidiums, and find that they usually flower during December and January. 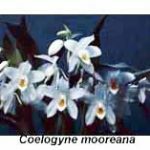 Coelogyne mooreana is one of a number of coelogyne species that will happily grow and flower in a ‘cosy’ shade house in Melbourne. Once uncommon in cultivation in Melbourne, it has become more widely grown over the last decade. Its crystalline white flowers are held on erect inflorescences that emerge from the new growths. They are less prone to mark when wet than are those of C. cristata, but even so it is best to avoid wetting them when watering. They usually last for at least a month. C. mooreana may flower several times each year, as each new growth develops but blooms most profusely in November and December. Thunia marshalliana is an Asian terrestrial orchid that resembles a small bamboo plant at maturity (in late summer). 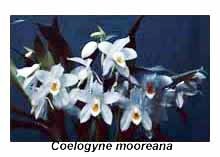 It is found growing on the ground, on rocks or in tree forks at altitudes of 1000-2300 m. A cluster of white cattleya-like flowers develops at the top of the cane by Christmas, up to ten flowers opening sequentially, although only three or four are open at the one time. The leaves turn brown and fall in autumn, and the plant remains dormant throughout winter and early spring. Then new growth begins to develop from the base of the dormant cane, reaching a height of 600-750 mm by Christmas. It needs a rich mix of garden loam and coarse sand, and benefits from regular watering and frequent applications of liquid fertiliser while in active growth. Stenoglottis woodii is a terrestrial orchid from South Africa. Its white (sometimes pink) flowers begin to open at Christmas time, and continue to do so sequentially over the next month or two. Most members are probably more familiar with Stenoglottis longifolia, which has a tall inflorescence bearing up to fifty pink flowers in autumn. S. woodii grows equally well in either a terrestrial mix or in a bark-based potting mix. Pholidota chinensis is a native of China and Burma, where it grows on damp rocks on stream banks, or as an epiphyte over a wide altitudinal range (300-2500 m). In cultivation it may be grown under either cool or intermediate conditions. If grown in the shade-house, the inflorescences develop in early summer. The inflorescences soon become pendant, providing an attractive display if the pot is suspended from the shade-house roof. Each inflorescence is said to bear as many as 35 green/buff-coloured flowers but my plants bear fewer flowers when grown without heat. The new growths appear in late winter but take many months to develop. Small plants take only a few years to develop into attractive specimens. Masdevallia veitchiana was introduced to cultivation in Europe in 1867. Its large red flowers and vigorous growth habit make it one of the most popular masdevallia species in cultivation today, at least among those orchid enthusiasts living in cool or temperate areas. Like most other masdevallia species, it needs cool, moist conditions, and is better suited to cultivation in southern Victoria and Tasmania than to the warmer northern states. 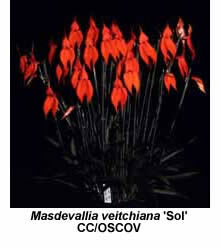 Although Masdevallia veitchiana may flower at any time, most flowers are produced in early summer.